This is a modern three bedroom townhome located in the prestigious Regal Palms Resort. This luxury Rental is just a short walk from the Regal Palms Clubhouse and Water Park (with lazy river, water slide, playground and hot tub), Day Spa, Restaurant and Bar. Regal Palms Resort & Spa is a safe, private, gated resort which can only be entered with electronic key cards. It has two heated pools, a children's pool, a waterslide, lazy river ride and a heated jacuzzi surrounded by waterfalls. 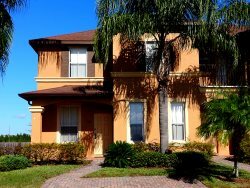 Within the Clubhouse there is a Restaurant, Sports Bar and a Game Room This 3 Bed, 3 Bath Town home is located next to the pool and clubhouse on the Regal Palms Resort which is just 6 miles and 15 minutes drive from Disney. The home comes with full kitchen facilities, king bedroom and 2 twin bedrooms. The home is also fully tiled downstairs. There is a fully equipped kitchen and the lounge has a TV and DVD player. The home is centrally located and is one of the closest on Regal Palms to the Clubhouse, Pool and all Resort facilities which is a huge bonus. Regal Palms resort is an ideal place to stay for a great value family holiday. The resort itself has 2 pool, a lazy river, water slide, games room, gym, spa, sauna, bar and restaurant with free wi-fi in the clubhouse. Please Note: There is a resort fee which is paid to Regal Palms directly for their facilities which are really good and include pool, lazy river, slide, gym etc. This charge is $12.95 + tax per night per house. A credit card is also needed as Regal Palms take $150.00 authorization as a fully refundable security deposit. Amenities One of closest homes to Resort Pool Three large bedrooms Beautifully furnished Close to Theme Parks Modern fully equipped Kitchen Washer & Tumble Dryer Use of all Resort Facilities Everything you need for a perfect stay Local Area Outside the resort nothing is too far away. Berry Town Centre Shopping Plaza is within easy walking distance. The Plaza has a Publix supermarket, CVS drug store, Bank, ATM, Fuel station, Applebees restaurant, Pizza parlor, British Bar and Fish & Chip Restaurant. Area Attractions The resort is 8 miles from Disney and the Theme Parks and 25 minutes drive from Orlando International Airport. In addition to being directly opposite the entrance to the Prestigious Highlands Reserve Golf Course and Driving Range, the resort is only a short drive from a host of other highly rated Central Florida golf courses. These include Southern Dunes, Orange County National and Reunion Resort.